Luke Gronneberg|AIM Media photo Tippecanoe’s Thomas Skaggs and Sidney’s Dominick Durr battle for the ball Tuesday at Sidney. Luke Gronneberg|AIM Media photo Tippecanoe’s Nick Robbins tries to drive around Sidney’s Josiah Hudgins Tuesday. SIDNEY — The Tippecanoe boys basketball team battled back against Greater Western Ohio Conference American North Divison leader Sidney Tuesday on the road, tying the score at halftime and even taking a third-quarter lead — but in the end, the Yellow Jackets were able to pull away late for a 62-48 victory. 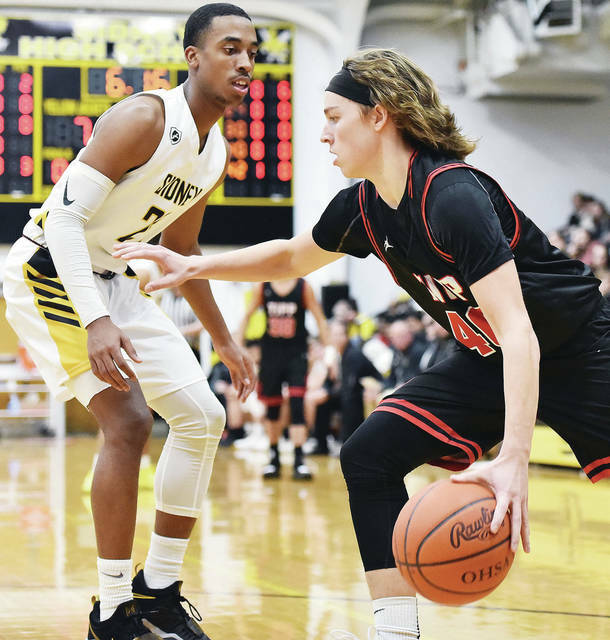 Andrew Gordon led all scorers with 28 points for Sidney, which improved to 13-3 overall and remained tied with Butler for the GWOC American North lead at 9-2. Josiah Hudgins added 17 points and Ratez Roberts added 12. Tippecanoe (5-10, 3-7 GWOC American North) finished the first half on a 12-4 run to tie it at 26-26 at halftime. After Gordon made a basket with 4:54 left in the third to put Sidney ahead 32-31, Tipp rattled off the next six points to take a five-point lead. Nolan Mader led the Devils with 21 points, Zach Frederick scored 10 and Nick Robbins chipped in nine. Tippecanoe travels to Piqua Friday night. WEST MILTON — After a busy week, Milton-Union’s boys basketball team snapped a four-game losing streak with a thrilling 53-51 victory against Tri-County North Tuesday in non-league play. Caleb Wintrow scored 14 points and had four rebounds off the bench to lead the Bulldogs, including hitting the game-winning jumper in the closing seconds to break up a tie game and give Milton-Union (5-11) the win. “We missed a free throw that would have put us up, but Caleb got the o-board and hit a baby fadeaway in the last second to give us the win,” Milton-Union coach Rusty Berner said. “The kids played hard after playing three games in four days last week. We shot 3 for 21 from 3-point range and missed some shots we would normally make, but we defended and pulled out the win. Sam Case added 10 points and four assists, Andrew Lambert scored eight points, Will Morris had seven points, seven rebounds, three assists and four steals and Brandon Lavey had seven points and four rebounds for the Bulldogs, who led 18-9 after the first quarter but saw that lead trimmed to 28-21 at halftime and 39-37 going into the fourth before the exciting conclusion. Milton-Union travels to Preble Shawnee Friday and Yellow Springs Saturday..
Other scores: Ansonia 73, Bethel (9-8, 5-4 CCC) 65. Brookville 80, Covington (3-12) 41. Butler 72, Piqua (5-11, 2-9 GWOC American North) 49. Lehman (6-8) 44, Mississinawa Valley 37. CEDARVILLE — The Newton girls basketball team’s four-game winning streak came to an end Tuesday night in a 68-36 non-league loss at Cedarville. Brooke Deeter led the Indians (9-9) with 12 points as Cedarville took a 19-13 lead after one, led 32-20 at halftime and outscored Newton 16-3 in the third to take a 48-23 lead. Other scores: Troy Christian (14-3) 43, Lehman (8-8) 26. 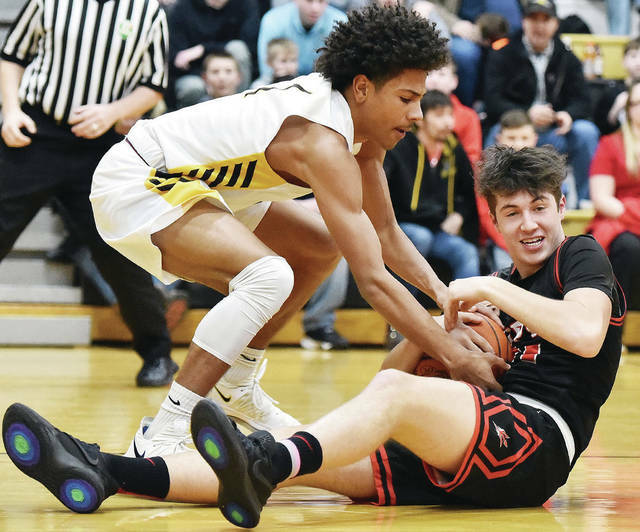 Arcanum 48, Bradford (12-6, 5-5 CCC) 40.
https://www.tdn-net.com/wp-content/uploads/sites/21/2019/01/web1_012919lg_tipp_thomasskaggs.jpgLuke Gronneberg|AIM Media photo Tippecanoe’s Thomas Skaggs and Sidney’s Dominick Durr battle for the ball Tuesday at Sidney. https://www.tdn-net.com/wp-content/uploads/sites/21/2019/01/web1_012919lg_tipp_nickrobbins.jpgLuke Gronneberg|AIM Media photo Tippecanoe’s Nick Robbins tries to drive around Sidney’s Josiah Hudgins Tuesday.